This article is about the U.S. political faction. For the modern British party of the same name, see Whig Party (British political party). For the defunct British Party, see Whigs (British political party). The name "Whig" repeated the term that Patriots used to refer to themselves during the American Revolution. It indicated hostility to the king. Despite the identical name it did not directly derive from the British Whig Party (see etymology). The American Whigs were modernizers who saw President Andrew Jackson as "a dangerous man on horseback"—like a king—with a "reactionary opposition" to the forces of social, economic and moral modernization. 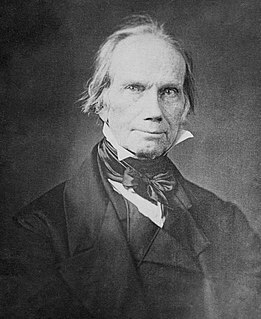 The Democratic-Republicans who formed the Whig Party, led by Kentucky Senator Henry Clay, drew on a Jeffersonian tradition of compromise, balance in government and territorial expansion combined with national unity and support for a Federal transportation network and domestic manufacturing. Casting their enemy as "King Andrew", they sought to identify themselves as modern-day opponents of governmental overreaching. Despite the apparent unity of Jefferson's Democratic-Republicans from 1800 to 1824, the American people ultimately preferred partisan opposition to popular political agreement. As Jackson purged his opponents, vetoed internal improvements and killed the Second Bank of the United States, alarmed local elites fought back. In 1831, Henry Clay re-entered the Senate and started planning a new party. He defended national rather than sectional interests. Clay's plan for distributing the proceeds from the sale of lands in the public domain among the states was intended to serve the nation by providing the states with funds for building roads and canals, which would stimulate growth and knit the sections together. However, his Jacksonian opponents distrusted the federal government and opposed all federal aid for internal improvements and they again frustrated Clay's plan. Jacksonians promoted opposition to the National Bank and internal improvements and support of egalitarian democracy, state power and hard money. The Tariff of Abominations of 1828 had outraged Southern feelings—the South's leaders held that the high duties on foreign imports gave an advantage to the North (where the factories were located). Clay's own high tariff schedule of 1832 further disturbed them as did his stubborn defense of high duties as necessary to his American System. However, Clay moved to pass the Compromise of 1833, which met Southern complaints by a gradual reduction of the rates on imports to a maximum of twenty percent. Controlling the Senate for a while, Whigs passed a censure motion denouncing Jackson's arrogant assumption of executive power in the face of the true will of the people as represented by Congress. The Whig Party began to take shape in 1833. Clay had run as a National Republican against Jackson in 1832, but carried only 49 electoral votes against Jackson's 219, and the National Republicans became discredited as a major political force. The Whig Party emerged in the aftermath of the 1832 election, the Nullification Crisis, and debates regarding the Second Bank of the United States, which Jackson denounced as a monopoly—and from which he abruptly removed all government deposits. People who helped to form the new party included supporters of Clay, supporters of Massachusetts Senator Daniel Webster, former National Republicans, former Anti-Masons, former disaffected Jacksonians (led by John C. Calhoun), who viewed Jackson's actions as impinging on the prerogatives of Congress and the states—and small remnants of the Federalist Party, people whose last political activity was with them a decade before. The "Whig" name emphasized the party's opposition to Jackson's perceived executive tyranny, and the name helped the Whigs shed the elitist image of the National Republican Party. Clay was the clear leader of the Whig Party nationwide and in Washington, but he was vulnerable to Jacksonian allegations that he associated with the upper class, at a time when white males without property had the right to vote and wanted someone more like themselves. The Whigs nominated a war hero in 1840, and emphasized that William Henry Harrison had given up the high life to live in a log cabin on the frontier—Harrison won. In the 1836 elections, the party was not yet sufficiently organized or unified to run one nationwide candidate. Instead, William Henry Harrison was its candidate in the Northern and border states, Hugh Lawson White ran in the South, Daniel Webster ran in his home state of Massachusetts, and Willie P. Mangum ran in South Carolina. Whigs hoped that four candidates would amass enough Electoral College votes among them to deny a majority to Martin Van Buren. That would move the election to the House of Representatives, allowing the ascendant Whigs to select their most popular man as president. Van Buren won 170 ballots in the Electoral College, with only 148 ballots needed to win, but the Whig strategy came very close to succeeding. In Pennsylvania, which had 30 ballots in the Electoral College, Harrison got 87,235 votes to Van Buren's 91,457. A change of just a few thousand votes in that state would have reduced Van Buren's ballot count to only 140, eight short of winning. The Whigs' internal disunity and the nation's increasing prosperity made the party's activist economic program seem less necessary, leading to a disastrous showing in the 1842 Congressional election. In 1848, the Whigs, seeing no hope of success by nominating Clay, nominated General Zachary Taylor, a hero of the Mexican–American War. They stopped criticizing the war and adopted only a very vague platform. Taylor defeated Democratic candidate Lewis Cass and the anti-slavery Free Soil Party, who had nominated former President Martin Van Buren. 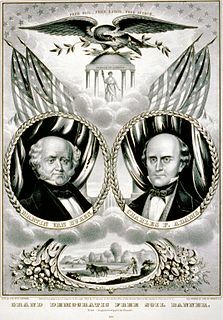 Van Buren's candidacy split the Democratic vote in New York, throwing that state to the Whigs. However, at the same time the Free Soilers probably cost the Whigs several Midwestern states. Taylor was firmly opposed to the proposed Compromise of 1850 (an initiative of Clay) and was committed to the admission of California as a free state. He proclaimed that he would take military action to prevent the secession of southern states. On July 9, 1850, Taylor died and Vice President Millard Fillmore, a long-time Whig, became President. Fillmore helped push the Compromise through Congress in the hopes of ending the controversies over slavery and its five separate bills became law in September 1850. After 1850, the Whigs were unable to deal with the slavery issue. Their Southern leaders nearly all owned slaves. The northeastern Whigs, led by Daniel Webster, represented businessmen who loved national unity and a national market, but cared little about slavery one way or another. However, many Whig voters in the North thought that slavery was incompatible with a free labor, free market economy and supported the Wilmot Proviso, which did not pass Congress, but would have stopped the expansion of slavery. No one found a compromise that would keep the party united. Furthermore, the burgeoning economy made full-time careers in business or law much more attractive than politics for ambitious young Whigs; thus, the Whig Party leader in Illinois simply abandoned politics after 1849, instead attending to his law business. When new issues of nativism, prohibition and anti-slavery burst on the scene in the mid-1850s, few looked to the quickly disintegrating Whig Party for answers. In the North, most ex Whigs joined the new Republican Party and in the South, they flocked to a new short-lived American Party. The election of 1852 marked the beginning of the end for the Whigs. 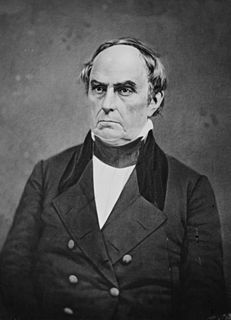 The deaths of Henry Clay and Daniel Webster that year severely weakened the party. The Compromise of 1850 had fractured the Whigs along pro- and anti-slavery lines, with the anti-slavery faction having enough power to deny Fillmore the party's nomination in 1852. The Whig Party's 1852 convention in New York City saw the historic meeting between Alvan E. Bovay and the New-York Daily Tribune's Horace Greeley, a meeting that led to correspondence between the men as the early Republican Party meetings in 1854 began to take place. Attempting to repeat their earlier successes, the Whigs nominated popular General Winfield Scott, who lost decisively to the Democrats' Franklin Pierce. The Democrats won the election by a large margin: Pierce won 27 of the 31 states, including Scott's home state of New Jersey. Whig Representative Lewis D. Campbell of Ohio was particularly distraught by the defeat, exclaiming: "We are slain. The party is dead—dead—dead!." Increasingly, politicians realized that the party was dead. In 1854, the Kansas–Nebraska Act, which opened the new territories to slavery, was passed. Southern Whigs generally supported the Act while Northern Whigs remained strongly opposed. Most remaining Northern Whigs, like Lincoln, joined the new Republican Party and strongly attacked the Act, appealing to widespread Northern outrage over the repeal of the Missouri Compromise. Other Whigs joined the Know Nothing Party, attracted by its nativist crusades against so-called "corrupt" Irish and German immigrants. In the South, the Whig Party vanished—but as Thomas Alexander has shown, Whiggism as a modernizing policy orientation persisted for decades. Historians estimate that in the South in 1856 former Whig Fillmore retained 86 percent of the 1852 Whig voters when he ran as the American Party candidate. He won only 13% of the Northern vote, though that was just enough to tip Pennsylvania out of the Republican column. The future in the North, most observers thought at the time, was Republican. Scant prospects for the shrunken old party seemed extant and after 1856 virtually no Whig organization remained at the regional level. Twenty-six states sent 150 delegates to the last national convention in September 1856. The convention met for only two days and on the second day (and only ballot) quickly nominated Fillmore for President, who had already been nominated for President by the Know Nothing Party. Andrew Jackson Donelson was nominated for Vice President. Some Whigs and others adopted the mantle of the Opposition Party for several years and enjoyed some individual electoral successes. The Whig ideology combined conservatism and modernization--with appropriate policies that were usually under heavy attack by the more democratic Democrats. Nevertheless the issues they raised became part of American political thought. They were typically rooted in evangelical Christianity, as expressed in the Second Great Awakening. Whigs linked moral progress and material progress--each needed the other. They supported Protestant religiosity and missions, while being fearful of Catholics. Whigs believed that a higher stage of morality would be achieved when America brought wealth and opportunity to everyone. Colleges and public schools would promote upward social mobility, discouraging immorality and dissipation. Rapid business expansion was good, not the moral danger Democrats warned about.. Gregory Bowen notes that the two parties were polar opposite and highly ideological: "At the heart of Democratic ideology was a militant egalitarianism which contrasted sharply with the Whigs' support for equality of opportunity to produce a meritocratic society." Historian John Ashworth shows how polarized the two parties were on important questions of economic development: "It was a clash of democracy with capitalism." Democrats glorified individualism while Whigs said it was a dangerous impulse that must be subordinated to the greater good of an organic society; they called for individuals to restrain themselves and focus on doing their duty. In 1860, many former Whigs who had not joined the Republicans regrouped as the Constitutional Union Party, which nominated only a presidential ticket. It had considerable strength in the border states, which feared the onset of civil war. Its presidential candidate, John Bell, finished third in the electoral college. During the Lincoln Administration (1861–1865), ex Whigs dominated the Republican Party and enacted much of their American System. Later, their Southern colleagues dominated the white response to Reconstruction. In the long run, the United States adopted Whiggish economic policies coupled with a Democratic strong presidency. During the latter part of the American Civil War and during the Reconstruction Era, many former Whigs tried to regroup in the South, calling themselves "conservatives" and hoping to reconnect with ex-Whigs in the North. Thus in Virginia and elsewhere moderate, nationalist, and economically innovative ex Whigs used the party name “Conservative” in order to avoid identification with the Democratic party. In a few years the Conservative Party merged into the Democratic Party in the South. However the ex-Whigs continued to promote modernization policies such as large-scale railroad construction and the founding of public schools. In today's American political discourse, historians and pundits often cite the Whig Party as an example of a political party that lost its followers and reason for being, as in the expression "going the way of the Whigs." a term referred to by Donald Critchlow in his book, The Conservative Ascendancy: How the GOP Right Made Political History. Critchlow points out that the application of the term by Republicans in the Republican Party of 1974 may have been a misnomer—the old Whig party enjoyed more political support before its demise than the Republican Party in the aftermath of Nixon's resignation. Historian Daniel Walker Howe argues the Whigs were modernizers, "who attached a great deal of importance to protecting property, maintaining social order, and preserving a distinct cultural heritage, three characteristic conservative concerns." He emphasizes their "moral absolutism, paternalism, and preoccupation for discipline." At the time and ever since, the Whigs have been called conservatives. The Whigs suffered greatly from factionalism throughout their existence as well as weak party loyalty that stood in contrast to the strong party discipline that was the hallmark of a tight Democratic Party organization. One strength of the Whigs was a superb network of newspapers—their leading editor was Horace Greeley of the powerful New-York Daily Tribune. In the 1840s, Whigs won 49 percent of gubernatorial elections, with strong bases in the manufacturing Northeast and in the border states. The trend over time was for the Democratic vote to grow faster and for the Whigs to lose more and more marginal states and districts. 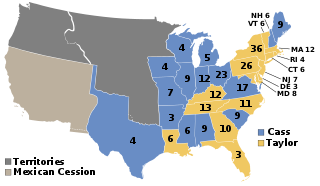 After the close 1844 contest, the Democratic advantage widened and the Whigs could win the White House only if the Democrats split. This was partly because of the increased political importance of the Western states, where farmers and frontiersmen generally voted for Democrats—and Irish Catholic and German immigrants, who voted heavily for the Democrats. The Whigs appealed to voters in every socio-economic category, but proved especially attractive to the professional and business classes: doctors, lawyers, merchants, ministers, bankers, storekeepers, factory owners, commercially oriented farmers, and large-scale planters. In general, commercial and manufacturing towns and cities voted Whig, save for strongly Democratic precincts in Irish Catholic and German immigrant communities. The Democrats often sharpened their appeal to the poor by ridiculing the Whigs' aristocratic pretensions. Protestant religious revivals also injected a moralistic element into the Whig ranks. The Whigs celebrated Clay's vision of the American System that promoted rapid economic and industrial growth in the United States. Whigs demanded government support for a more modern, market-oriented economy, in which skill, expertise, and bank credit would count for more than physical strength or land ownership. Whigs sought to promote faster industrialization through high tariffs, a business-oriented money supply based on a national bank and a vigorous program of government funded "internal improvements" (what we now call infrastructure projects), especially expansion of the road and canal systems. To modernize the inner United States, the Whigs helped create public schools, private colleges, charities and cultural institutions. Many were pietistic Protestant reformers who called for public schools to teach moral values and proposed prohibition to end the liquor problem. The Democrats harkened to the Jeffersonian ideal of an egalitarian agricultural society, believing that traditional farm life bred republican simplicity while modernization and urbanization threatened to create a politically powerful caste of rich aristocratic men who threatened to subvert republicanism. In general the Democrats enacted their policies at the national level while the Whigs succeeded in passing modernization projects in most states. The Whig Party was never a homogeneous party. It was essentially divided into two main factions: the anti-slavery Conscience Whigs, based in Northern states, and the pro-South Cotton Whigs, also based in the industrial North, who wanted to maintain good business terms with the southern planters. While the "Consciences" were noted for their moral opposition to slavery, their Cottons counterpart's close association with the New England textile industry led them to de-emphasize the slavery issue. Notable Consciences included Charles Sumner, Henry Wilson and Charles Francis Adams while the Cottons were led by such figures as Edward Everett, Robert C. Winthrop and Abbott Lawrence. The Consciences split from the Whig party in 1848, when the national party nominated the slave-owning General Zachary Taylor for President and played a role in the creation of the new Free Soil Party, which nominated Adams for Vice President on a ticket with anti-slavery former Democratic President Martin Van Buren. Following the failure of the Free Soil Party in the election that year, most Conscience Whigs returned to the Whig fold, and more followed after the Compromise of 1850 temporarily neutralized the slavery issue. During the mid-1850s, several Conscience leaders played an important role in the founding of the Republican Party. In Liberia, the True Whig Party—named in direct emulation of the American Whig party, was founded in 1869 and it dominated politics in that country from 1878 until 1980. Occasionally, small groups in the United States form parties that take the Whig name, but they seldom last long or elect anyone. In 2006, the Florida Whig Party formed, and fielded one candidate for Congress in the elections of 2010. It disbanded in 2012. In 2008, a small group of veterans formed the Modern Whig Party. The Quincy Herald-Whig, a daily newspaper published as of 2018 in Quincy, Illinois, is a direct descendant of a 19th century Whig Party newspaper, the Quincy Whig. See also Stephen Simpson, editor of the Philadelphia Whig, a 19th century newspaper devoted to the Whig cause. Of the four members of the Whig Party who were president, only two were ever elected to the position. William Harrison was elected in 1840, died in 1841, and was succeeded by his vice president, John Tyler. Zachary Taylor was elected in 1848, died in 1850, and was succeeded by his vice president, Millard Fillmore. No other member of the party would be elected to the office following the end of Fillmore's term. Additionally, John Quincy Adams, elected President as a Democratic-Republican, later became a National Republican, then an Anti-Masonic, and then a Whig after he was elected to the House of Representatives in 1831. Presidents Abraham Lincoln, Rutherford B. Hayes, Chester A. Arthur and Benjamin Harrison were Whigs before switching to the Republican Party, from which they were elected to office. ^ a: Merged in the Opposition Party at 34th Congress inauguration. ^ b: Office left vacant when Tyler assumed the presidency on April 4, 1841. ^ c: Office left vacant when Fillmore assumed the presidency on July 9, 1850. ^ d: Office left vacant after King's death on April 18, 1853. ^a Tyler was elected Vice President as a Whig, but his policies soon proved to be opposed to most of the Whig agenda and the party officially expelled him in September 1841, five months after he took office as President. ^ "National Republican Party". Dictionary of American History. 2003. In 1834 the National Republican Party was absorbed by the new and larger Whig Party [ ... ]. ^ The Editors of Encyclopædia Britannica (July 20, 1998). "Whig Party". Encyclopædia Britannica. Retrieved August 29, 2017. ^ "The Whig Party". The North Carolina History Project. Retrieved April 20, 2019. ^ "Congress at a Glance: Major Party Ideology Throughout History". Retrieved April 15, 2019. ^ "Bush's Ancestors". Retrieved April 15, 2019. ^ Holt (1999), p. 231. ^ Holt (1999), pp. 27–30. ^ Frank Towers, "Mobtown's Impact on the Study of Urban Politics in the Early Republic." Maryland Historical Magazine 107 (Winter 2012) pp: 469-75, p. 472, citing Robert E, Shalhope, The Baltimore Bank Riot: Political Upheaval in Antebellum Maryland (2009) p. 147. ^ a b c Alexander (1961). ^ Peter Charles Hoffer (2006). The Brave New World: A History of Early America. JHU Press. p. 449. ISBN 978-0-8018-8483-2. ^ David Brown, "Jeffersonian Ideology and the Second Party System." Historian 1999 62(1): 17–30. ^ Holt, Michael F. (2003). The Rise and Fall of the American Whig Party. Oxford University Press. pp. 26–29. Retrieved September 23, 2015. ^ Holt pp. 979–80 Archived June 27, 2012, at the Wayback Machine. ^ Richard Carwardine, Evangelicals and Politics in Antebellum America (1993) pp 89, 106-7. ^ Gregory L. Bowen, "Antebellum Parties and Party Systems." Australasian Journal of American Studies (1988) 7#2 pp. 33-40 online at p 34. ^ John Ashworth, Agrarians and Aristocrats: Party Political Ideology in the United States, 1837-1846 (1987) p. 131. ^ Jack P. Maddex Jr. (2018). The Virginia Conservatives, 1867-1879: A Study in Reconstruction Politics. U of North Carolina Press. p. 13. ^ Donald T. Critchlow, The Conservative Ascendancy: How the GOP Right Made Political History (2007) p. 103. Additional examples are of online. ^ Critchlow, Donald T. "The Conservative Ascendancy: how the GOP right made political history". Harvard University Press. Retrieved May 9, 2016. ^ Daniel Walker Howe (1984). The Political Culture of the American Whigs. U of Chicago Press. pp. 183, 210. ^ Lynn Marshall. "The Strange Stillbirth of the Whig Party," American Historical Review, (1967) 72#2 pp. 445–68 online. ^ Donald T. Critchlow and Philip R. VanderMeer (2012). The Oxford Encyclopedia of American Political and Legal History. Oxford UP. pp. 280, 358–59, 381–83. ^ Critchlow and VanderMeer (2012). The Oxford Encyclopedia of American Political and Legal History. p. 213. ^ John R. McKivigan (1999). Abolitionism and American Politics and Government. Taylor & Francis. p. 120. ^ Eric Foner (1995). Free Soil, Free Labor, Free Men: The Ideology of the Republican Party Before the Civil War: With a New Introductory Essay. Oxford UP. p. 113. ^ Louis Sandy Maisel; Mark D. Brewer (2008). Parties and Elections in America: The Electoral Process. Rowman & Littlefield. p. 38. ^ Dominik Zaum; Christine Cheng (2011). Corruption and Post-Conflict Peacebuilding: Selling the Peace?. Routledge. p. 133. ^ "The Florida Whig Party". Retrieved September 22, 2014. ^ "Is it time for a new political party?". Retrieved September 22, 2014. Alexander, Thomas B. (August 1961). "Persistent Whiggery in the Confederate South, 1860–1877". Journal of Southern History. 27 (3): 305–329. doi:10.2307/2205211. JSTOR 2205211. Formisano, Ronald P. (Winter 1969). "Political Character, Antipartyism, and the Second Party System". American Quarterly. 21 (4): 683–709. doi:10.2307/2711603. JSTOR 2711603. Formisano, Ronald P. (June 1974). "Deferential-Participant Politics: The Early Republic's Political Culture, 1789–1840". American Political Science Review. 68 (2): 473–87. doi:10.2307/1959497. JSTOR 1959497. Howe, Daniel Walker (March 1991). "The Evangelical Movement and Political Culture during the Second Party System". Journal of American History. 77 (4): 1216–39. doi:10.2307/2078260. JSTOR 2078260. Kruman, Marc W. (Winter 1992). "The Second Party System and the Transformation of Revolutionary Republicanism". Journal of the Early Republic. 12 (4): 509–37. doi:10.2307/3123876. JSTOR 3123876. Marshall, Lynn. (January 1967). "The Strange Stillbirth of the Whig Party". American Historical Review. 72 (2): 445–68. doi:10.2307/1859236. JSTOR 1859236. Shade, William G. (1983). "The Second Party System". In Paul Kleppner, et al. (contributors) (ed.). Evolution of American Electoral Systems. "Conscience Whigs". Gale Encyclopedia of US History. The Gale Group / Answers.com. 2006. Archived from the original on July 26, 2008. Retrieved July 26, 2008. "Free-Soil Party." Encyclopædia Britannica. 2006. Encyclopædia Britannica Online. 5 Feb, 2006 http://search.eb.com/eb/article-9035288. Howe, Daniel. The Political Culture of the American Whigs. The University of Chicago Press, Chicago, 1979. "Liberty Party." Encyclopædia Britannica. 2006. Encyclopædia Britannica Online 5 Feb. 2006 http://search.eb.com/eb/article-9048133. "Whig Party." Encyclopædia Britannica. 2006. Encyclopædia Britannica Online, 5 Feb. http://search.eb.com/eb/article-9076767. Brauer, Kinley. Cotton Versus Conscience; Massachusetts Whig Politics and Southwestern Expansion, 1843-1848. Cole, Arthur Charles (1914). The Whig party in the South, American Historical Association, 392 pages; e-book. Mueller, Henry Richard (1922). The Whig Party in Pennsylvania, Columbia university, 267 pages; e-book. Ormsby, Robert McKinley (1859). A History of the Whig Party, Crosby, Nichols & Company, Boston, 377 pages; e-book. Palmerston, Viscount Henry John Temple; Crocker, John Wilson, Peel, Robert (1819). The new Whig guide, Wright, London; e'Book. Pegg, Herbert Dale (1932). The Whig Party in North Carolina, Colonial Press, 223 pages; Book. Smith, Ernest Anthony (1975). Whig Principles and Party Politics: Earl Fitzwilliam and the Whig Party, 1748-1833, Manchester University Press, 1975, 411 pages; ISBN 978-0-7190-0598-5; Book. Watson, William Robinson (1844). The Whig Party: Its Objects—its Principles—its Candidates—its Duties—and Its Prospects, Knowles and Vose, Printers, 44 pages; e-book. Whig Party in Virginia in Encyclopedia Virginia. The American Presidency Project, contains the text of the national platforms that were adopted by the national conventions (1844–1856). "Whig Party" . Encyclopædia Britannica (11th ed.). 1911. Gilman, D. C.; Peck, H. T.; Colby, F. M., eds. (1905). "Whig Party" . New International Encyclopedia (1st ed.). New York: Dodd, Mead. The Democratic-Republican Party was an American political party formed by Thomas Jefferson and James Madison around 1792 to oppose the centralizing policies of the new Federalist Party run by Alexander Hamilton, who was Secretary of the Treasury and chief architect of George Washington's administration. From 1801 to 1825, the new party controlled the presidency and Congress as well as most states during the First Party System. It began in 1791 as one faction in Congress and included many politicians who had been opposed to the new constitution. They called themselves Republicans after their political philosophy, republicanism. They distrusted the Federalist tendency to centralize and loosely interpret the Constitution, believing these policies were signs of monarchism and anti-republican values. The party splintered in 1824, with the faction loyal to Andrew Jackson coalescing into the Jacksonian movement, the faction led by John Quincy Adams and Henry Clay forming the National Republican Party and some other groups going on to form the Anti-Masonic Party. The National Republicans, Anti-Masons, and other opponents of Andrew Jackson later formed themselves into the Whig Party. Thurlow Weed was a New York newspaper publisher and Whig and Republican politician. He was the principal political advisor to the prominent New York politician William H. Seward and was instrumental in the presidential nominations of William Henry Harrison (1840), Zachary Taylor (1848), and John C. Frémont (1856). Historians and political scientists consider the Second Party System to be a term of periodization to designate the political party system operating in the United States from about 1828 to 1854, after the First Party System ended. The system was characterized by rapidly rising levels of voter interest, beginning in 1828, as demonstrated by Election Day turnouts, rallies, partisan newspapers, and high degrees of personal loyalty to parties. The 1848 United States elections elected the members of the 31st United States Congress. The election took place during the Second Party System, nine months after the Treaty of Guadalupe Hidalgo ended the Mexican–American War. With the issue of slavery dividing the nation, the Free Soil Party established itself as the third most powerful party in Congress. California joined the union before the next election, and elected its first Congressional delegation to the 31st Congress. Whigs won the Presidency, but Democrats won a plurality in the House and retained control of the Senate. In 1840, William Henry Harrison was elected President of the United States. Harrison, who had served as a general and as United States Senator from Ohio, defeated the incumbent president, Democrat Martin Van Buren, in a campaign that broke new ground in American politics. Among other firsts, Harrison's victory was the first time the Whig Party won a presidential election. A month after taking office, Harrison died and his running mate John Tyler served the remainder of his term, but broke from the Whig agenda, and was expelled from the party.